With special introduction by artist Joan Snyder, the screening will be followed by a Q&A with artist Ida Applebroog and director Beth B. Director Beth B is an interdisciplinary artist working in narrative, documentary and experimental films, videos, media, photography and sculpture installations for museums, galleries, public art spaces, theaters and television. On Wednesday, May 25, from 6-9pm, the 4th Annual Taste of Woodstock, will celebrate the culinary diversity and delicacies that the region has to offer with over 20 participants including Bistro-To-Go, Bread Alone, Catskill Mountain Pizza, Cheese Louise, Cucina, Garden Cafe, The Green Palate, Landau Grill, Mountain Gate Indian Restaurant, New World Home Cooking, Oriole 9, Peace Love & Cupcakes, Provisions Woodstock, The Reservoir Inn, Santa Fe Woodstock, Shindig, Sunflower Café, The Tea Shop of Woodstock, Woodstock Wine & Liquors, Woodstock Meats, and Yum Yum Noodle Bar. Read more here. For tickets and further details, visit our website. The Woodstock Film Festival will host the 4th SPIRIT OF WOODSTOCK CELEBRATION on Saturday, June 4th from 5-8pm. As in past years, the Spirit of Woodstock will celebrate honorees who embody the fiercely independent spirit that has made Woodstock famous for over 100 years. This year's honorees, Ron Nyswaner and Philippe Petit, are recognized internationally for their individualism and their artistry. Read more here. The event will be held at a scenic estate overlooking the Ashokan Reservoir, where attendees can stroll the spectacular grounds and enjoy cocktails and hors d'oeuvres while mingling with and hearing from the honorees. Proceeds will go towards the Woodstock Film Festival, which celebrates its 17th year this fall, October 13-17. The funds raised will help bring the high quality films, filmmakers, talent and other events that draw audiences from around the country and the world to the towns of Woodstock, Saugerties, Kingston, Rosendale, and Rhinebeck. For tickets, visit our website. 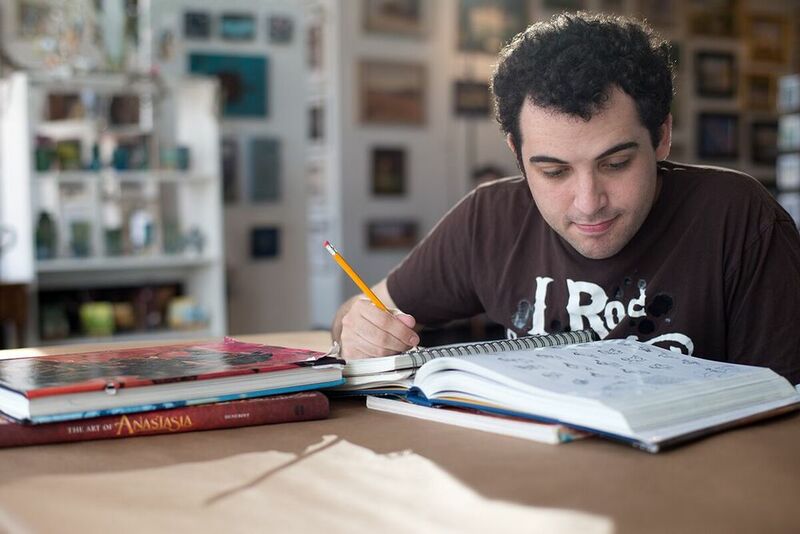 LIFE, ANIMATED is the inspirational story of Owen Suskind, a young man who was unable to speak as a child until he and his family discovered a unique way to communicate by immersing themselves in the world of classic Disney animated films. This emotional coming-of-age story follows Owen as he graduates to adulthood and takes his first steps toward independence. The subject of his father Ron Suskind’s New York Times bestseller, Owen was a thriving three year old who suddenly and inexplicably went silent – and for years after remained unable to connect with other people or to convey his thoughts, feelings or desires. Over time, through repeated viewings of Disney classics like THE LITTLE MERMAID and THE LION KING, Owen found useful tools to help him to understand complex social cues and to re-connect with the world around him. LIFE, ANIMATED evocatively interweaves classic Disney sequences with verité scenes from Owen’s life in order to explore how his identification and empathy for characters like Simba, Jafar, and Ariel gave him a means to understand his feelings and allowed him to interpret reality. Beautiful, original animations offer rich insights into Owen’s fruitful dialogue with theDisney oeuvre as he imagines himself heroically facing adversity as a member in a tribe of sidekicks. Owen’s story is a moving testament to the many ways in which stories can serve as a means of persevering through the dark times, leading us all toward the light. View a special clip from the film here. "My films have always been about championing the outsider – this is what makes filmmaking such an exciting adventure," Says filmmaker Roger Ross Williams, "With LIFE, ANIMATED, I wanted to tell an incredible story but I also wanted to create a space that would offer insight into Owen Suskind and other people living with autism. Owen is a unique person for many reasons, chief among them are his emotional openness and scrupulous honesty. His vision of the world is extraordinary because he is unencumbered by many of the world’s social cues whose main purpose is to restrict behavior and curb spontaneity. And that's very refreshing to me. What Owen has done by living his life immersed in myths and fables is find a way to dissect the world and in so doing he has come to an incredibly wise and rich understanding of the human condition. What Owen draws from these classic stories is an understanding of the world that is as deep and complex as it is inspirational and instructive. It was important to me to get inside Owen's head and tell his story from his point of view. Too often the world looks askance at people who are outside of society's mainstream; this film is about looking at one of these outsiders in great detail, but from the inside, looking out at the world. The process of making LIFE, ANIMATED expanded my vocabulary as a filmmaker, translating Owen's unique way of seeing the world into pictures and sound that help us better understand a truly extraordinary individual." Screening is courtesy of The Orchard. The Woodstock Film Festival is pleased to announce that the Haskell Wexler Cinematography Award will continue under the guardianship of Wexler's friend and colleague Ellen Kuras, carrying on Wexler’s legacy for years to come. The 2016 Woodstock Film Festival takes place October 13-16. The WOODSTOCK FILM FESTIVAL is proud to announce that Joy Buran and Noelle Melody have come on board to curate the Annual Animation Spectacular. They will follow the path created by Bill Plympton and Signe Baumane, continuing a rich history that has featured incredible animated shorts from around the world ever since it was launched by Bill Plympton back in 2002. The 2016 Woodstock Film Festival takes place October 13-16. Illustrators, animators and twins, Buran and Melody studied Media Arts at the Pratt Institute in Brooklyn and are now a NY based animation and design duo, JOY + NOELLE. Clients have included A+E Digital, Nickelodeon, Cartoon Network, TED, Cartuna, Amazon Studios, and Sesame Street Workshop, among others. The 17th Annual Woodstock Film Festival is now open for submissions. Film categories include narrative & documentary features, short narrative, student short narrative, short documentary, animation, music videos, and teen films. The late deadline is June 15. The Woodstock Film Festival is honored to announce that Founding Sponsor Markertek is back on board for 2016. We are very grateful to them for their continued support. Markertek is a highly specialized broadcast and pro-audio supply house serving the technical side of the media industry with over 60,000 unique solutions at reasonable prices - supported with dependable advice from actual pro-audio and video professionals. The Markertek catalog has achieved cult status among digital media professionals as the ultimate design tool for creating the electronic infrastructure required to produce the majority of primetime television shows, feature films, commercials and chart-topping music hits, as well as all other areas in the audio and video industry. We would like to also extend a thank you to our official 2015 WFF sponsors and three advertisers who joined us for year-round Newsletter support: Mid- Hudson Limo, Sunflower Natural Foods Market, and Waterside Getaways!